That order showed up nice and quickly, the cable itself was of great quality and saved me buying very expensive pre-terminated audio cable. I will gladly be buying from you guys in the future whenever possible. 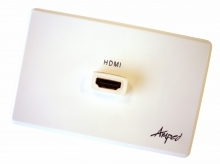 Amped Classic Single HDMI (White Wall Plate) + FREE SHIPPING! HDMI technology is the buzz of late. It's the ants-pants and the bees-knees of the hi-fi and data connectivity world! These days you're pretty hard pressed to find new TVs, Monitors and laptops without this increasingly popular technology. So it makes sense that Cable Chick would bring you the Amped Classic Single HDMI (White Wall Plate)! Crafted to blend seamlessly with your existing wall plates, the Amped Classic Single HDMI (White Wall Plate) is certified to the latest HDMI v1.3c standard (HDCP 1.2) and uses premium 24k gold plated corrosion resistant contacts that guarantee pure and accurate High Definition Digital Video transmission including 1080p (Progressive Scan). The classic smooth custom finish offers a professional quality that is tailored to suit most existing Australian wall plates. The durable construction with premium quality fitting guarantees this products will last for years to come – and If you don't believe us, believe the exclusive 10 Year Guarantee! Comes with everything required for the perfect fit, every time. Suits high-bandwidth resolutions including 480p, 480i, 720p, 1080i, 1080p, 1440p and beyond! Many thanks for letting me do business with you. It has been a pleasurable experience from start to finish. Service was excellent, good products and arrived very quickly. I will certainly do business again.